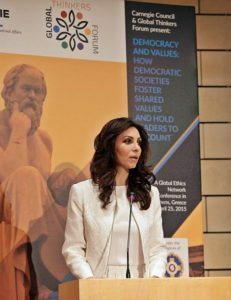 Elizabeth Filippouli, CEO, and founder of Global Thinker is best known as with the basically focus on leadership, positive change and social entrepreneurship. She has also worked as a presenter, journalist and even in media and international organisation like AI Jazeera English and CNN. Elizabeth Fillippouli, a Greek nationality was born on August 13, 1974, in Athens, Greece. She joined the National Kaposdistriakon University of Athens, where she completed bachelor in German Literature. In 2004, she enrolled at Harvard University to complete Diploma in Managing and Shaping Change in the information age. Then, she graduated from City University with a degree of MA in Transnational Media and Globalisation in 2008. In 2010, she attended University of Oxford-Said Business School and received the degree of MA in Strategy and Innovation. At the beginning of her career, Fillippouli served Greek press and Tv where as a journalist. In 2007, she moved to London and worked for GT and GTF. She has worked with the board of News Xchange, the International NewsSafety Institute and also associated with Royal Television Society and the Certified Institute of PR. Fillippouli has profound herself in various occupation. She was the member of AI Jazeera English, Doha Qatar, where she produced many documentaries such as Greekgate and Italygate and King Without a Country. She also worked with CNN International for six years as a reporter on Greek affairs and on breaking news in Greece. She was also a presenter for the Greek public television and also worked with Greek Press and radio. Elizabeth launched "Global Thinker" in 2010 as a next generation HR and business development Consultancy, helping companies to focussed on new markets with the improvement in leadership and collaboration generating innovative ideas. Moreover, in 2012, Elizabeth launched Global Thinker Forum (GTF) which promote ideas exchange with a new strategy for the development of leadership practices with the involvement of massive investors, media representatives and more than 10,000 CEO. Elizabeth Filippouli, sharing her ideas and plan to develop "Global Thinker Forum." It also organised award named "Global Thinker Forum Awards for Excellence" to appreciate the work of forward -thinking a leader with remarkable achievement. Also, Global Thinkers Forum launched an international mentoring program " Global Thinker Mentor" in support of Youth and Women's overall development. Fillippouli served as a media and crisis management consultant with the international firms like the "National Lottery", "Athens Olympic Games", Coca-Cola, TIM and NewsXchange. She is frequently invited to talk about leadership, women empowerment, youth development and global networking. Fillippouli, gorgeous and talented woman is the daughter of Greek journalist Stamatis Fillipouli. According to her public profile, she is neither married nor in any relationship. There is no rumour about Fillippouli affairs, boyfriend or dating. She is possibly single and very much career oriented with high profile professionalism. Journalism is her primary profession and is involved in various projects like "Global Thinker", AL Jazeera English and also served in different station and post. So, it is evident that she has collected massive amount and her net worth is assumed more than a million.